The challenge was simple. As part of the 100th Anniversary of Nikon, Digital SLR Photography magazine wanted to run a limited edition issue. Four photographers were tasked with each providing a cover image. The catch? It not only had to be a new image but also taken with a specific camera. In my case, the D500. With a pre-planned trip to Slovenia I knew that would be my best bet. Ending only two days before the deadline and with an unexpected 24 hours spent in Cologne, due to a bomb scare on my flight home, it certainly came down to the wire! I knew this image would work well for one simple reason. As a full frame portrait, with eyes looking straight out at the viewer, it grabs your attention. It’s a very simple concept but despite good light levels, on a clear day at around 5pm, the photo is taken at a surprisingly high ISO. There are a several essential reasons for this. There was need for a 1.4x teleconverter to get the bears head to fill the frame. With the converter added, I chose to stop down to f5.6 to increase my depth of field and counter the small loss of sharpness. With a 1.4x attached to my 400mm, on the DX sensor of the D500, I had an effective field of view of 825mm. This achieved the close up view I wanted. It’s key to remember that the larger the subject in the frame, the more movement is emphasised and the faster the shutter speed needed to freeze that movement. Less than 1/1000 and I was pushing the limits of stopping the bears motion. Despite the bright ambient light, the bear was actually in the shade of a large tree. Whilst my ISO would have dropped dramatically had the bear been in the light, it would have been contrasty. By being in the shade, everything has been softened down considerably which results in excellent detail in the fur. This wasn’t planned but was a happy coincidence. Situations such as this are exactly why I’ve long welcomed high ISO improvements. They’re not just useful for shooting low light but also very good for getting faster shutter speeds, and larger depths of field, in moderate to good light. You always lose a stop of two of noise when you print an images, and the D500 certainly held up very well in these conditions, printing incredibly well. When the email came through asking for my participation in this Shoot the Cover commission, it gave me roughly 3 weeks in which to take a suitable image. With a 5 day trip to Slovenia having been booked months before, and ending just two days prior to the deadline, it seemed the ideal opportunity. Even more so as, on a personal note, I’ve long wanted to photograph bears. Being able to do so, with this extra twist of a specific purpose, was a great way to enjoy my first bear encounters. And so here I found myself, in the beautiful Slovenian countryside, being hosted by slovenianbears.com. The initial idea was to try for a nice full body portrait. During the first few days, the images I captured of this nature were nice but not really what I deemed cover quality. So, I decided to switch tactic and try for that full on, frame filling, headshot. On the third evening I went back to a hide I’d spent time in previously. By scouting out the various options available I determined this particular location would offer the best opportunity for the close-up portrait I now wanted. With much of the forests being on hillsides, the hide was elevated to allow for shooting across to the bears, giving the appearance of being at eye level. However, at this location, I had noted the bears previously arrived to the right, and from a slope very close to the hide itself. That would allow me to shoot down towards them whilst they were close. The hide, in the thick of the Slovenian forests. I climbed into the hide around 330pm and sat quietly for around an hour and a half, listening to the sounds of the forest. With the sun dipping in and out from behind light cloud, the conditions were excellent. It wasn’t long before the same two bears from the previous day appeared once more. I’m not usually a high frame rate shooter but with one of the bears coming in close enough for the image I wanted, I found myself making full use of the D500’s high frame rate. Shooting in quick, controlled, bursts to maximise my success. All in all I captured around 54 images, which I shortlisted down to 3 and sent in to the magazine. Of those, the one I suspected would be the preferred image was indeed chosen. The slight trick to this image for me, was in shooting wide enough to allow for text and logos to be placed around the frame. My vision for the image was a tight crop but for the illusion of that, it actually needed to be supplied to the magazine looser. Then, once all the copy was placed around the frame, the illusion of that tight crop is maintained. Sadly, the teleconverter used for this photo would never be used by me again. With my flight home diverted to Cologne, due to what later turned out to be a false alarm bomb scare, we were evacuated off the plane and had to leave belongings behind. We were able to collect them 10 hours later, at 4am, but in my sleep deprived state I left my jacket behind – pockets stuffed with both my 1.4 and 2x TC’s, plus the grip to my D810. The diverted flight also served as a good reminder that you should always carry a backup of your images with you. I usually do, but for some reason left both my drives in my hand luggage for this flight. So when there was initial suggestion we may have to wait a few days for our bags to be sent on to us, I was a little worried. Thankfully that didn’t come to pass and I eventually walked through my front door 23 hours later than planned, early evening on the 11th, hand luggage in tow. Just in the nick of time to process my images, write up the accompanying text and email it all over to the magazine for the 12th. And so there we have it. 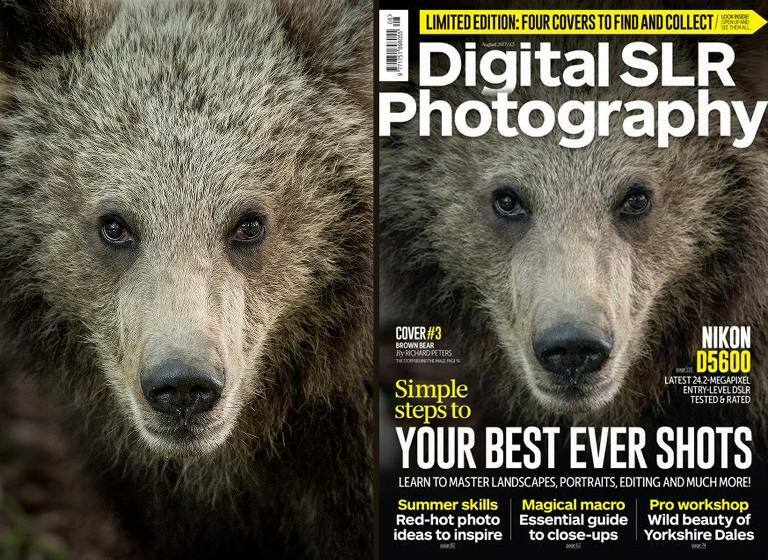 As the stories behind the photos go, my bear cover shot will no doubt prove to have one of the most surreal ends to a photoshoot for quite some time!